SHELTER focuses attention on a universal subject and one of humanity’s most basic needs in all its manifestations: the home, the psychology of personal space, current issues in the housing market such as homelessness, the mortgage crisis and loss of historic fabric. 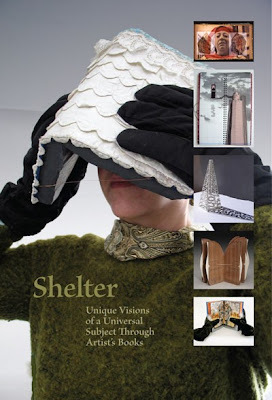 43 artists have been chosen to participate in SHELTER, an exhibition of artist’s books juried by Janine Wong, faculty member in the College of Visual and Performing Arts at UMASS/Dartmouth. This show is presented in partnership with Boston Book Arts, a group of artists dedicated to advancement of the book arts. The show will be on view 12- 5 pm until April 22. The exhibition will travel to several venues including the gallery at Rhode Island School of Design, Pyramid Atlantic Book Arts Center, and Wells College, New York.